Bloom has gotta be one of the freakish, most unsettling villains that Snyder has produced, and that’s including the stuff he’s done with the Joker. 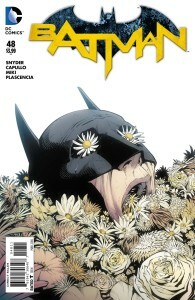 Bloom calls for the citizens of Gotham to rise up against the authorities, inciting a riot as he distributes his seeds across the city using an effective, but long winded, garden metaphor. Bat-Gordon is effectively useless, but there’s someone else who could answer the call, someone else who cares for this city and will do the utmost to protect it. “Whoever could that be?” We all wonder. Side note: the final page splash with Bruce bursting in on a sobbing Alfred got me so good.